Package include a total of 32 pieces - triangle flags bunting banner, rose gold sequin table runner, rose gold confetti balloons, rose gold latex balloons & a ribbon roll, which help you to save time & money to buy in a pack! We have done the calculation for you, It cost more than $25 if purchasing them separately! Table runner size : 11.5 width x 108 inches length, which can fit a 9 foot table nicely, or fit a smaller table with perfect drop at both side. This package can help you to nicely decorate a photo booth or as a background! Represents love, passion, luxury and prosperity. You can widely use this decoration kit from house party to office events, or even showers, birthday celebration and wedding! Buy now with confidence! We are sure that you will love this product, but for your complete peace of mind, we offer a hassle free 30-day returns policy (start from date of purchase) with no question asked. Contact us anytime and we will solve everything for you. 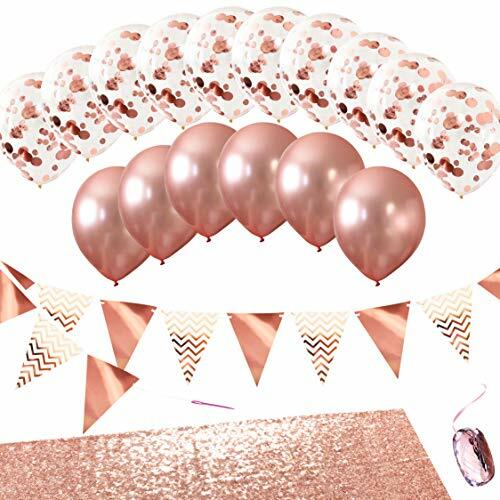 ✿ VALUE PACK FOR EASE & SAVINGS - Package including a total of 32 pieces - triangle flags bunting banner, rose gold sequin table runner, rose gold confetti balloons, rose gold latex balloons & a ribbon roll, which help you to save time & money to buy them in a pack and that is all you need for your party! We have done the calculation for you, It cost more than $25 if purchasing them separately! ✿ PERFECT SIZE - Table runner size : 11.5 width x 108 inches length, which can fit a 9 foot table nicely, or fit a smaller table with perfect drop at both side. This package can help you to nicely decorate a photo booth or as a background! ✿ LUXURIOUS ROSE GOLD - Represents love, passion, luxury and prosperity. You can widely use this decoration kit from house party to office events, or even showers, birthday celebration and wedding! ✿ SATISFACTION GUARANTEED - Buy now with confidence! We are sure that you will love this product, but for your complete peace of mind, we offer a hassle free 30-day returns policy (start from date of purchase) with no question asked. Contact us anytime and we will solve everything for you. If you have any questions about this product by MONKA, contact us by completing and submitting the form below. If you are looking for a specif part number, please include it with your message.